Product #60815 | SKU P133-9DSW | 0.0 (no ratings yet) Thanks for your rating! Featuring a Full HD IPS panel, it can be used for HD as well as SD workflows in studio, broadcast, and other professional video applications. 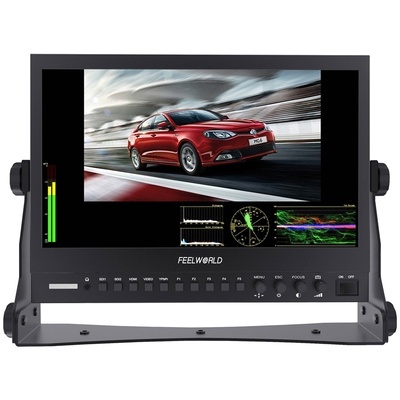 The FeelWorld P133-9DSW 13.3" Broadcast LCD Monitor can be used for HD as well as SD workflows in studio, broadcast, and other professional video applications. The rear panel contains SDI, HDMI, DVI, component, and composite inputs; outputs are available for SDI, HDMI, component, and composite. A separate audio input for analogue stereo audio is available via RCA connections. A tally input can be used for studio integration, activating the 3-colour tally light atop the display. A V-Mount bracket on the rear of the monitor can be used to power the display in the field, in addition to 12V barrel and 4-pin XLR jacks. Gold Mount plates are available separately. Professional monitoring tools such as focus peaking, markers, monochrome, R/G/B-only, pixel-to-pixel mapping, and image flip are built-in for analysing your video and ensuring a proper image. Scopes can be displayed transparently on top of the image or in a black bar below the image, depending on preference. If shooting outdoors, attach the included sun hood for optimal contrast. A U-bracket is also included for convenient tabletop mounting.